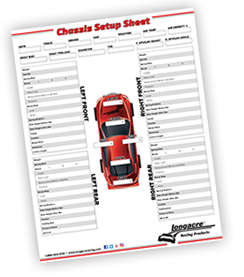 When we recently set up our Project Modified for our first race, we followed a simple list of to-do items that are the same for every race car I ever set up. Before you start your season, you need to create your own list so that you don’t miss perfecting everything that can affect your chassis performance. Think of this as indeed a list and if you have learned the details of each item, then just be sure to keep them on your list so that you can go over that part of your setup not only at the beginning of the year, but during the season when things might happen to affect and change that part of the setup. When you set up your race car in the shop before going to the races, you obviously will set the static toe at the front end. Keep in mind that the toe can change as you turn the steering wheel. If our car gains toe when it is steered then we have what is called Ackermann effect. 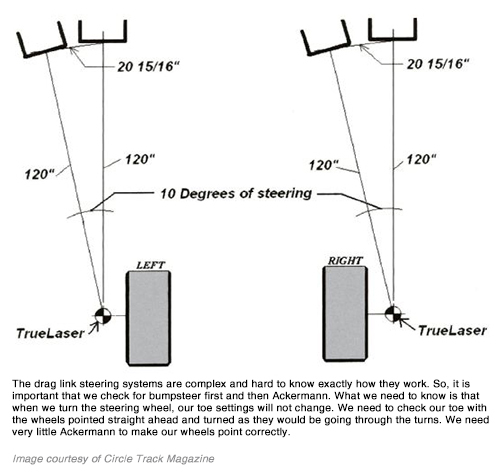 If our car loses toe when it is steered, we have Reverse Ackermann. In today’s race cars, we do not need the Ackermann effect. Static toe provides all of the required difference in steering angle we will need to negotiate the turns. The amount of static frontend toe you need largely depends on the size of the racetrack, the banking angle, and the type of tire being used. But we have determined that the most toe you would need is under a 1/4 inch and on longer tracks of three-quarter mile or longer, under an 1/8 inch is adequate. Many times we are faced with incorrect arm angles for proper Moment Center design because of a spindle that is either too short or too tall. If we can find a spindle with different dimensions, we may be closer to having the correct arm angles. If we change from a 73/4-inch-tall spindle, with an offset of 31/2 inches from the bottom of the spindle to the center of the pin, to an 81/2-inch-tall spindle with a 31/2-inch offset from the bottom to the pin center, then we have raised the upper ball joint by 3/4 inch and not changed the lower control arm angle. 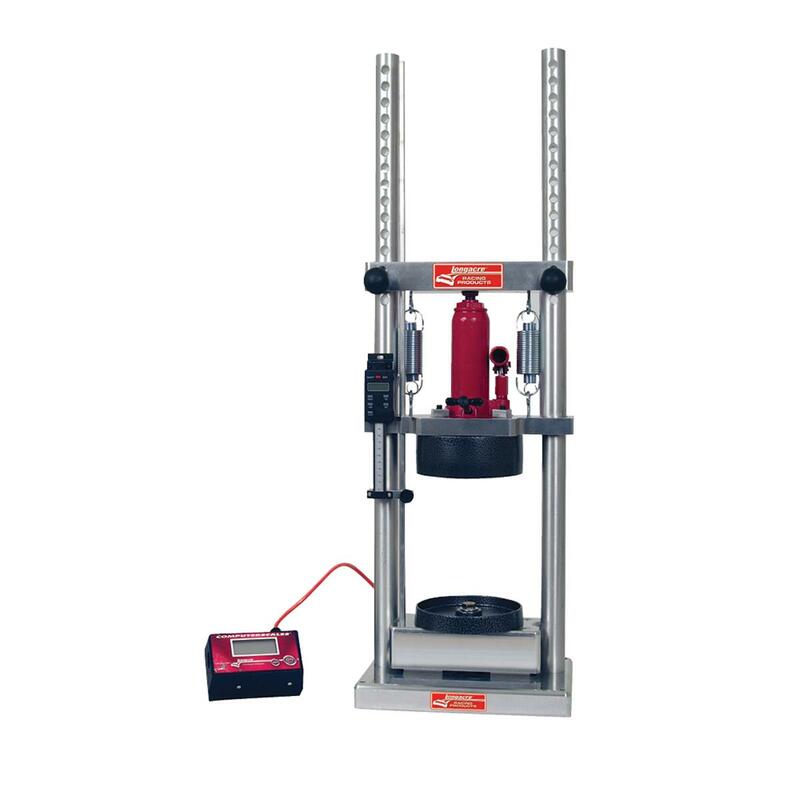 We can also install a 91/4-inch-tall spindle with a 41/2-inch offset from the bottom to the pin and gain 1/2 inch of height of the upper ball joint while lowering the bottom ball joint by 1 inch. This does two things. It increases the upper control arm angle and also reduces the lower control arm angle. At any rate, be aware of the different spindle designs related to the changes you may need to make to refine your MC design. Always keep in mind that spindles are very easy to change and you should never get locked into using a specific spindle. Rather, install what will make your car work better. With the availability of multiple-length ball joint shafts, we can tune our arm angles by installing different ball joints and the tuning of the arm angles has become much less of a problem and less expensive. 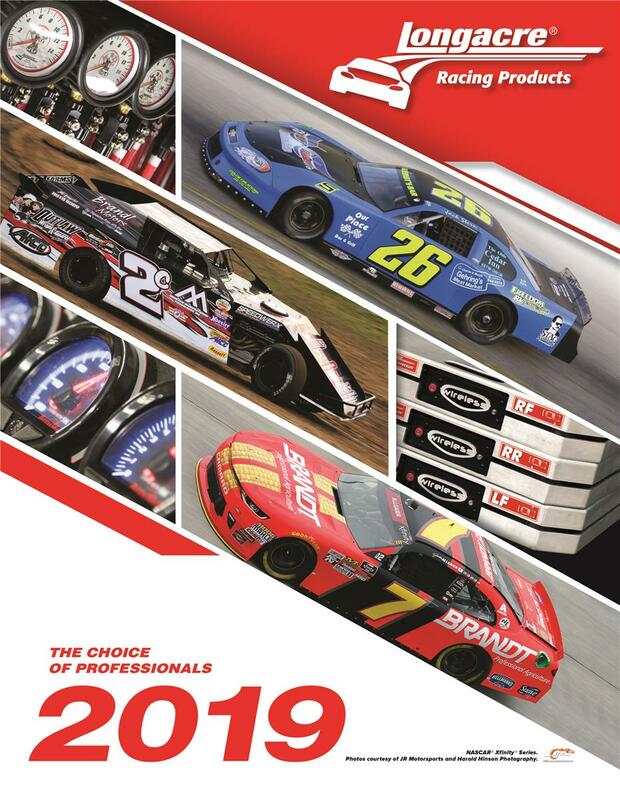 In my experience, you can get all of the information concerning the proper choosing and use of brake components for your type of racing from your racing brake supplier and/or manufacturer. What is probably more important than components is the actual brake pressures the system produces at each wheel. This is an area where brake pros cannot help you. 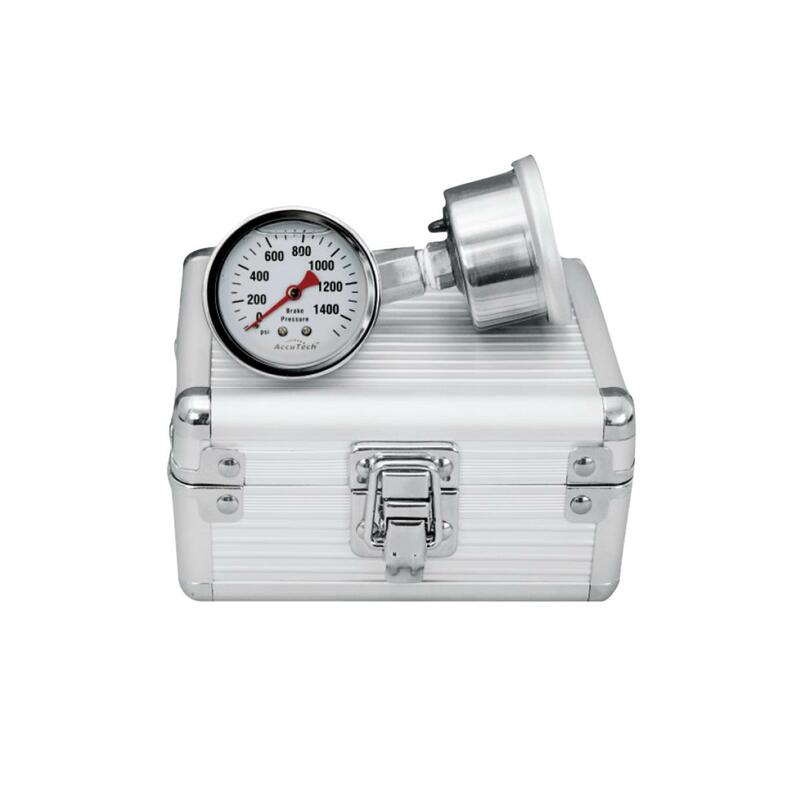 You need to measure the brake pressures and decide if you need to install different-sized master cylinders to regulate the pressures so that the front brakes generate approximately 60-65 percent of the braking force. 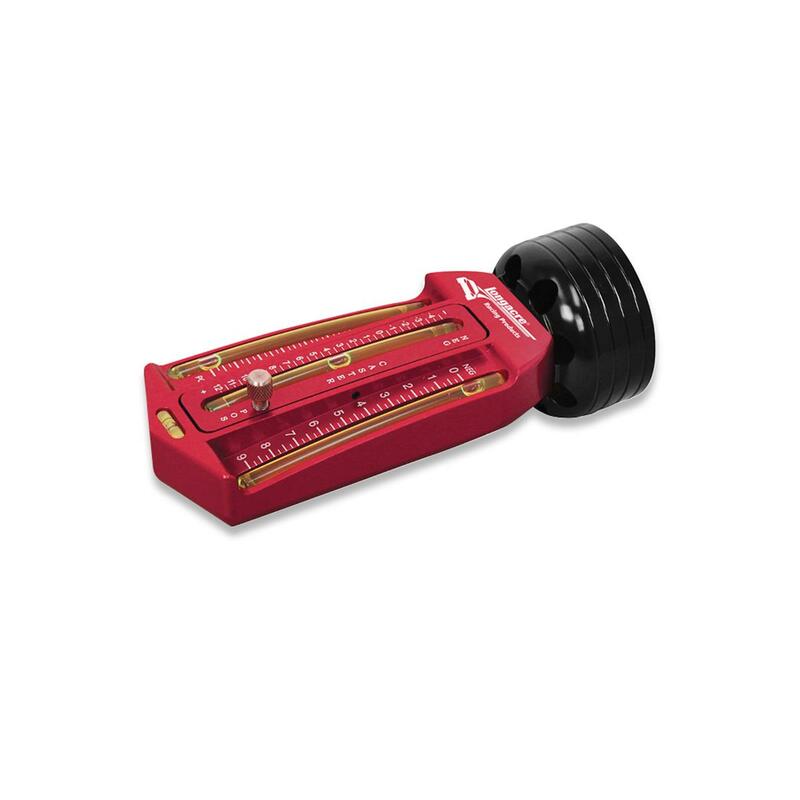 You can install brake pressure gauges into the bleeder holes, or as some racers do, install permanent pressure gauges in the dash. 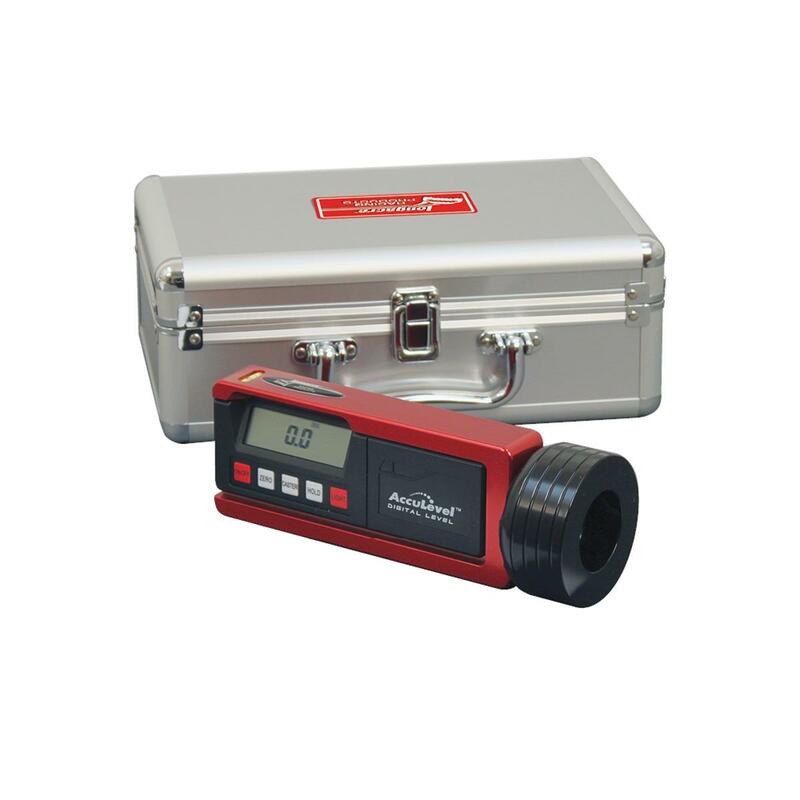 Either way, know what pressures and differences in pressure your system has. I’m not going to go into the description of the Moment Center here, we’ve been there many times before. But for every car you set up, the knowledge of MC location is a must-have on your setup list. Here’s why. The primary reason why two seemingly identical cars will handle differently can often be traced to a front MC that is in a different location from car to car. Knowing the role of the MCs and being willing to make changes so that our MCs are in the right position is one of the very first and most important steps we take to achieve the total handling package. We have found interesting information about front cambers that might fly in the face of traditional theory. For a given brand of tire, our goal is to gain the maximum tire footprint. This does not necessarily come from having even tire temperatures across the tread of the tire. The actual footprint might just be greater when we have more loading on the inside (toward the inside of the turns) of the tire than if the load were distributed evenly across the tire. This creates more heat on the inside and maybe that is what we are looking for. The actual footprint, if we could observe it printed on a piece of paper, would look like a side view of a Hersey’s Kiss candy. Even loading would produce a linear picture, kind of like a regular bar of candy. The area of the first example would be greater, and therefore produce more grip than that of the latter example. Think about that. The very first thing to consider when talking about springs is knowing the exact spring rate at each corner of your car. You must rate each spring and do it in the proper way. 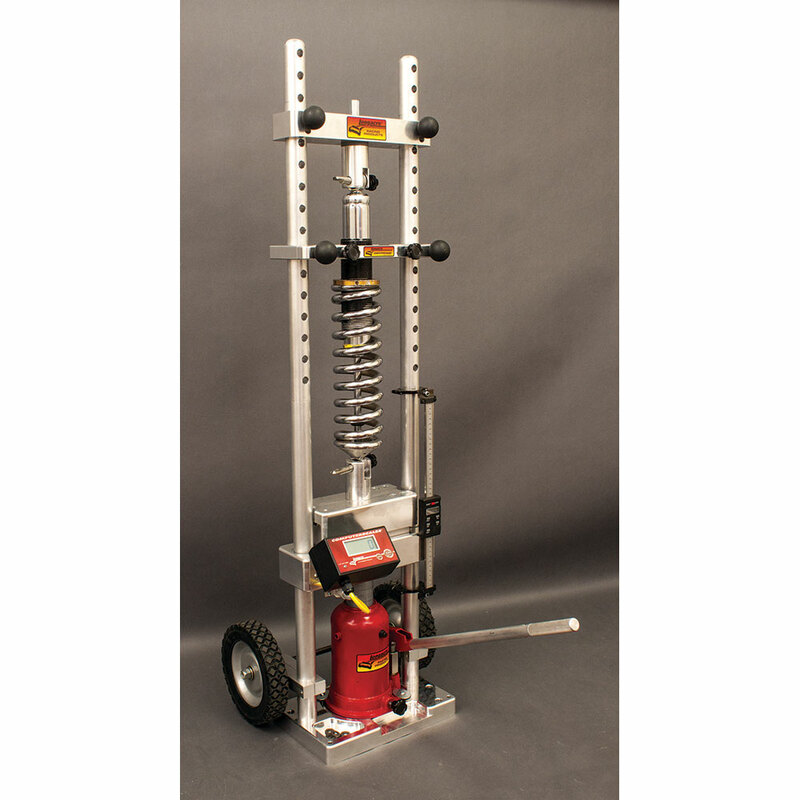 You need to know the spring rate of your springs at the installed height and range that they will be working in the car. Make sure of your spring rates, replace bent or fatigued springs, and always know your wheel rates when altering the mounting points or transferring the setup from one car to another. The car basically rides on four springs and the more we know about how they work in our cars, the more accurately we can develop a winning setup. The spring rates and spring split across each axle help determine the desired attitude, or roll angle of that end of the car. Changing spring rates is a primary setup tool to get both ends of the car to match up their attitudes. When they are working together, the car is well on the way to a balanced state. 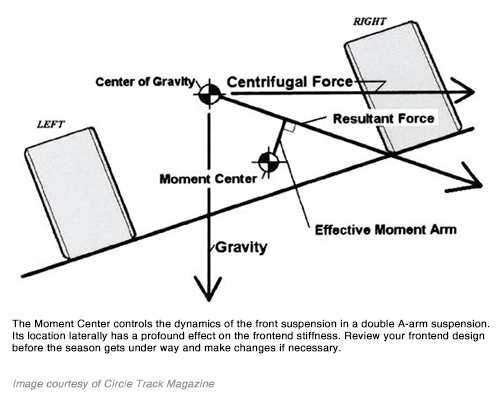 We should never try to solve basic setup problems by making changes to our shock stiffness. What we have learned in the past is that trying to use shocks to overcome mid-turn handling problems can be frustrating and futile. Solve your setup problems before experimenting with shocks. 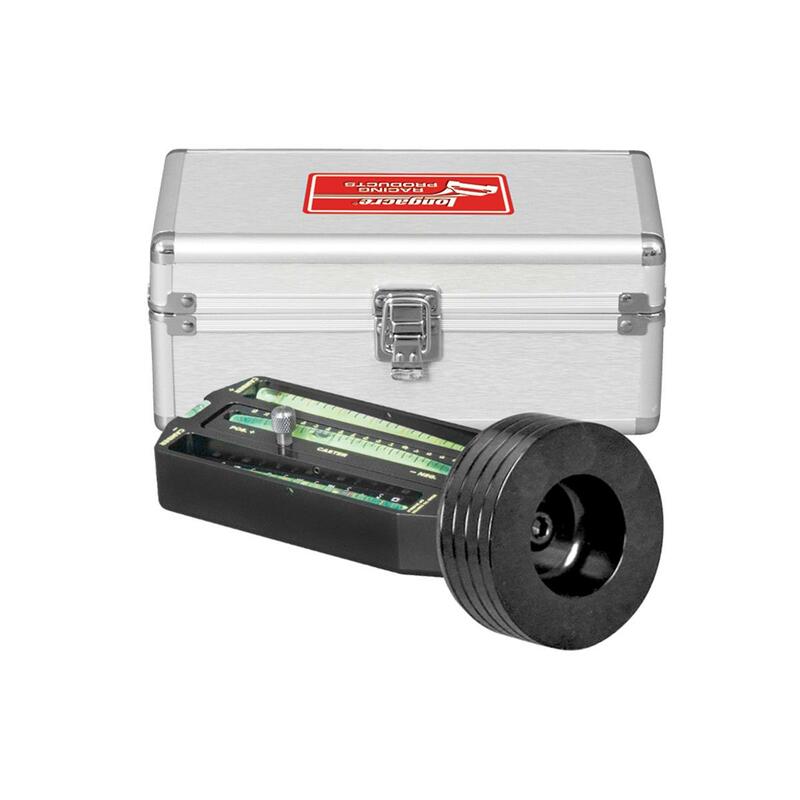 Most experienced shock technicians will tell you to put standard rate shocks on the four corners until the setup is sorted out. Then make changes to one corner at a time to see and feel the results. The most important task is to make the driver more comfortable and that will translate into faster lap times. 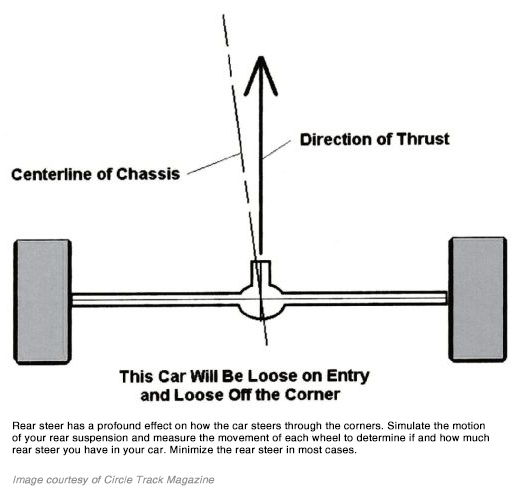 Rear Steer (RS) in a race car is a condition caused by suspension movement and/or rearend rotation. Under the right conditions, RS can be beneficial and enhance performance. Under the wrong conditions, it can ruin your handling. We need to have a solid understanding of what produces RS and what effect RS has on the handling in our cars. The first and foremost thing to understand about RS is that it is caused by rear suspension movement. As the rear corners of the car move, along with the controlling arms that locate the rearend fore and aft, each side can move the wheel on that side forward or to the rear. If both of the wheels did not move or moved in the same direction by the same amount, we would have zero RS. On asphalt, don’t make large changes to components that influence rear steer. Make small adjustments, if you feel you need to, and once you find the correct amount of rear steer, stay there and tune the handling with the other components. When racing on dirt, watch the conditions and be prepared to make changes accordingly, not just to the setup, but also related to rear steer. That way, the car will stay fast and balanced throughout all of the changing conditions. If there is one thing we usually cannot get enough of it is forward bite in our race cars. We need to think out how to maximize our bite while we are in the shop before our first race. An opposing pair of tires (tires on the same axle at the same end of the car) will develop maximum traction when they are equally loaded. The closer we can get a pair to being equal, the more traction they will have. The shape of your track can influence the available traction in several different ways. As we apply power, we need to know a little about how the track is banked, how the banking angle is changing coming off the corners, and how the radius of the turn might be changing. The tracks we worry about getting off the corners are the ones that are flatter and with less surface grip. When all available and usable methods of promoting traction have been applied, the car may still be difficult to apply power to without losing rear traction. 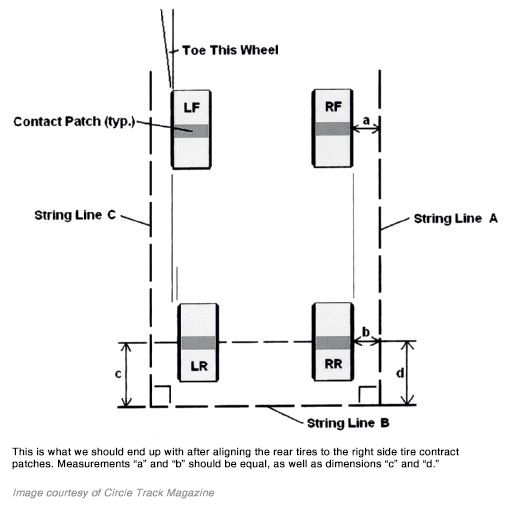 In that case the drivers must use their skills to help prevent loss of rear traction coming off the corners. Many top drivers have perfected the art of throttle control to help maintain traction. This means that if the driver knows he/she cannot apply full throttle without the rear tires spinning, then they will work to apply just enough power to accelerate without breaking the tires loose. 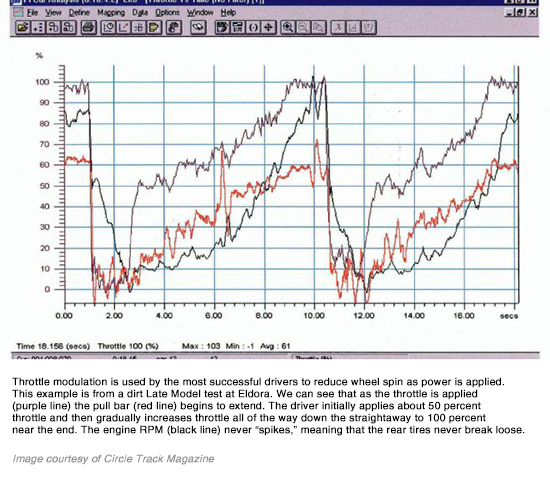 Now is the time to discuss throttle control and power modulation. Mechanical grip is simply having the maximum loading on the four tires through the turns. A setup that will distribute the overall load of the car onto the four tires more evenly will produce more traction and go faster through the turns. The extensive studies of the properties of tires all came to the conclusion that a pair of tires will produce more traction when they are evenly supporting the load upon an “axle.” The axle term is used here to mean any two opposing tires in a suspension system. The relationship between the two suspension systems will dictate how that transferred load ends up being distributed upon the four tires and spring rates and shock values have the most influence on that. 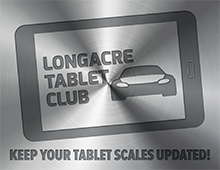 As we make positive changes to bring our car to a more balanced setup, we will need to make corresponding changes to the load distribution. Reducing front roll stiffness causes more front traction and the cross weight percent must be increased to keep the car from becoming loose. Increasing the rear roll stiffness will also cause the same effect, so too is the need to increase the cross weight percent. Don’t think you have to maintain a given cross weight percent number. 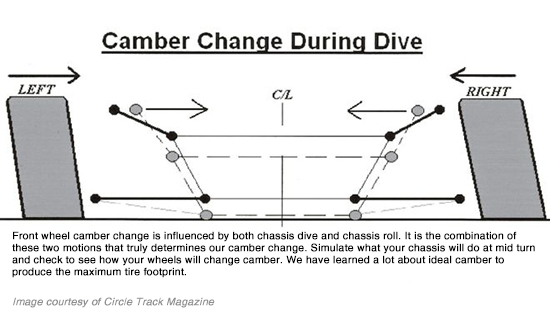 Be flexible and understand what is happening when you make spring rate changes and/or Panhard bar height changes. If you understand the influence of weight distribution and load transfer, you can then make more intelligent chassis setup decisions. The alignment of the wheels on your race car is done in the shop under controlled conditions. We often talk about first steps and critical design issues and alignment is at the very top of the list. While it is probably true that a car out of alignment is more forgiving on dirt, it is still very important for both dirt and asphalt to have your wheels properly aligned. You must know where your wheels are pointed and be ready and willing to make changes if they are not aimed in the right direction. This whole process of aligning your race car should only take about an hour or two if there are several team members helping. That is very little effort expended to make sure your car will track correctly. 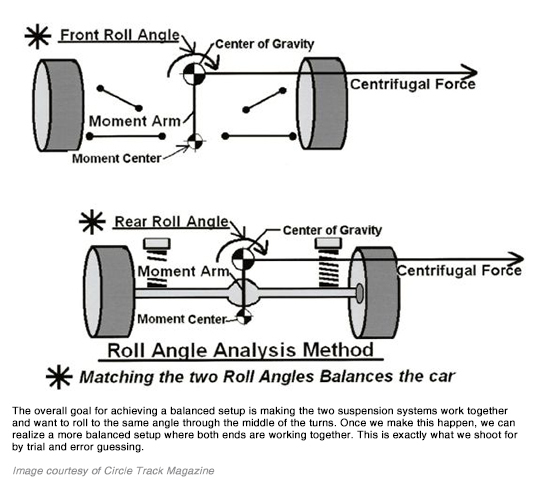 A balanced setup is not only one that causes the car to be neutral in handling. More importantly, it is a setup that causes all four wheels to work their hardest. It comes from choosing the spring rates, Moment Centers, and load distribution that causes the loading on all four tires to be the most possible. 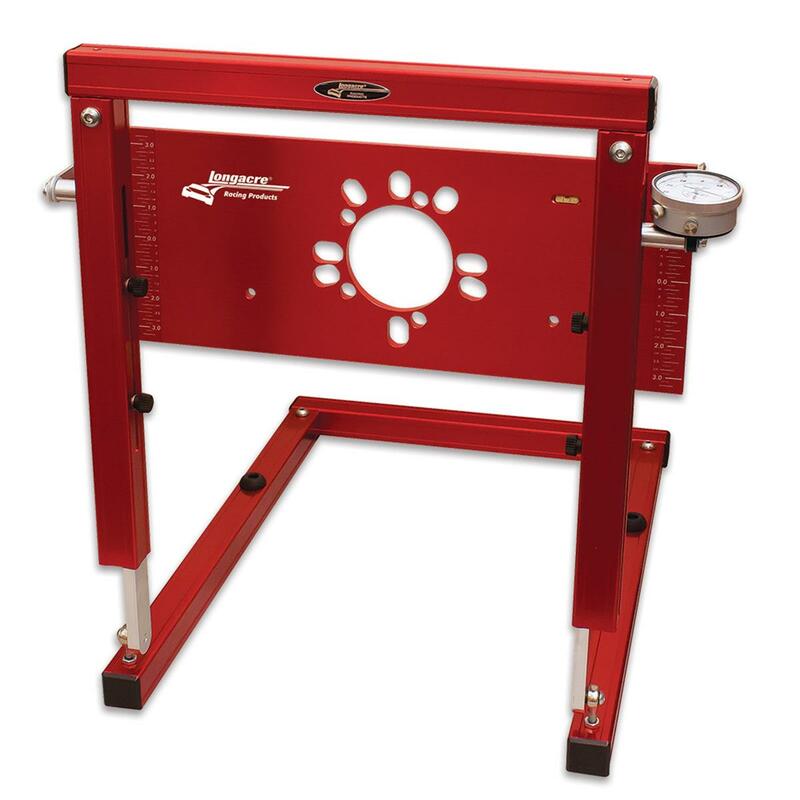 There are several critical reasons why a balanced setup is essential to optimum chassis performance. 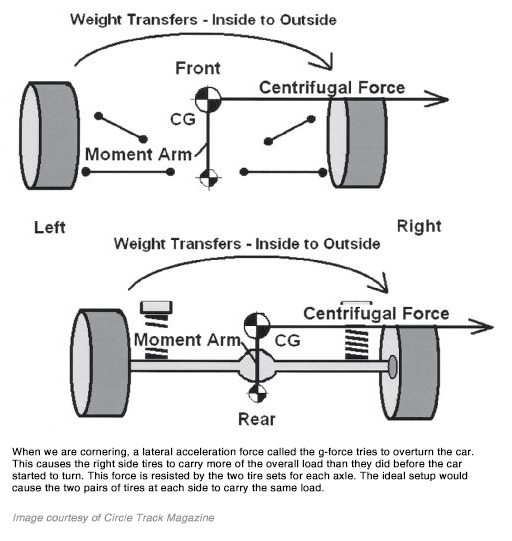 First of all, we can accurately predict load transfer if the setup in the car is balanced. Secondly, we will have less (almost non-existent) chassis flex with a balanced setup. Compliance, or flexing of the chassis, cannot occur if we remove the forces that cause this to happen. Last, and most importantly, a balanced setup is much more forgiving when the track conditions change or the driver runs different grooves. The speed of the car does not fall off as much either, as the race goes on and the tires wear. It is the tendency of the balanced setup to help maintain a neutral handling characteristic and retained speed after a long run that helps win races. Races and championships are won in the shop before a season begins. I get lots of calls later in the season about problems racers are having with their setups. Most of the time the cause of the problem could have been found and fixed in the shop before the first race was ever run. Use this outline to go over each area we have discussed. 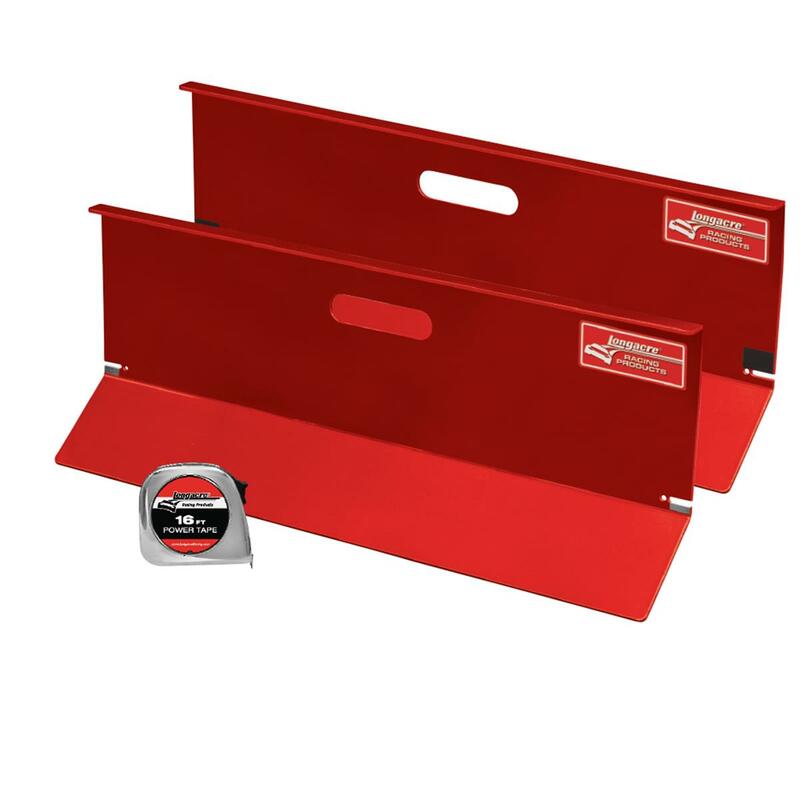 When you get these critical items right for your car, you’ll be much more successful.